If you live in a rural area and you have pets, you probably worry about attacks on their lives from more aggressive animals like coyotes and bobcats, depending on what part of the country you’re from. But it isn’t just rural areas where this can happen. All the way from Cape Cod to San Diego in suburban or urban neighborhoods dog and cat owners have sadly seen their beloved pets disappear or come to harm from these seldom seen creatures. As anyone who’s ever lost a pet to predators like these well knows, just because we don’t often see them doesn’t mean they’re not out there. The Dept. of Energy & Environmental Protection warns that animals less than 25 lbs. are vulnerable to coyote attacks. So, what can you do to protect your pets without having to monitor them constantly or keep them on an extremely short leash? 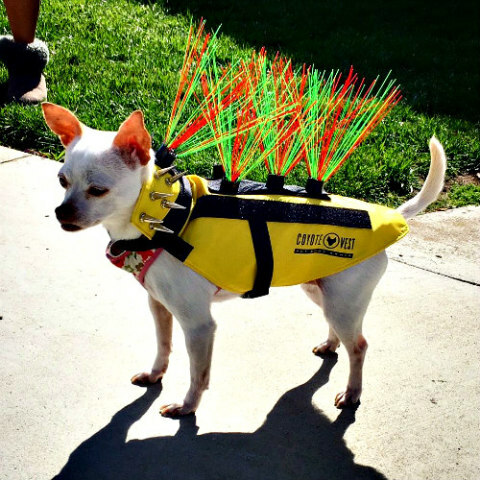 Thanks to inventor Paul Mott and his wife Pam, the first CoyoteVest has been developed for protecting small animals from attacks by predators or even larger, more aggressive dogs. The inspiration for the design came after the couple’s own dog suffered an attack. Buffy, as the dog was affectionately known, fell prey to a coyote, and the incident had a lasting impact on the couple — so much so that they didn’t want to even take their other dogs out for a walk anymore. Once the initial shock wore off, about two months later, the duo began searching for protective wear to keep their remaining pets safe. Due to dwindling habitat, coyote attacks are actually up on humans and pets. After extensive research on the Internet for existing products, they came up empty handed. That’s when they decided to design and create their own protective wear and began the experimental phase in their quest for pet safety. The project took several months to complete, with a lot of revisions and prototypes in between, but they ultimately got the job done. The final outcome is pretty wild looking, to say the least. Made from Kevlar, the CoyoteVest resembles a yellow safety vest like you’d see on a jobsite that has been embellished with punk rock elements such as metal spikes and a colorful Mohawk. It reminds you of something you might put together for a Halloween costume for your dog. When you first look at it you’ll laugh. But as long as it works, who cares? It’s like carrying an umbrella or wearing rain boots when you were a kid. You hated doing it at the time, but as you’ve gotten older you can embrace the wisdom of it. Looks aside, the point is that animals won’t be able to bite your dog’s neck, back, spine or the top of their rump where they often experience tenderness from hip and spinal problems. Even if an attacker were to manage to gain purchase somehow, their canines can’t penetrate the Kevlar material the vest itself is made out of. The whole thing is pretty creative, actually, with the Mohawk feature being referred to as "whiskers" by the inventors. The Mott’s dogs don’t seem to be bothered by wearing their new suits of body armor. If anything, they don’t really even appear to notice they’re wearing them. That’s because the safety vests are lightweight and fitted with the kinds of straps and buckles you’d find on life vests for dogs or seat belt safety harnesses for dogs. The DIY inventors have already made over a hundred of these CoyoteVests, and they can be used against attacks from birds of prey as well. You can learn more about them in the video below.